Benjamin Crofut began his studies on Double Bass through the public school system in Buffalo, NY. 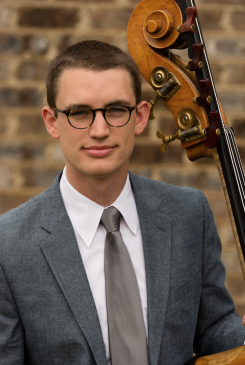 Prior to his appointment as Instructor of Double Bass at the University of Alabama, Benjamin earned the Bachelors of Music degree with Distinction from the Eastman School of Music (Rochester NY), a Masters of Music degree from Duquesne University (Pittsburgh PA), and a Professional Studies Certificate from the Colburn School (Los Angeles CA). As a performer, Benjamin has played with the Columbus Symphony, Rochester Philharmonic, members of the Pittsburgh Symphony, and the Kaleidoscope Chamber Orchestra. Benjamin’s primary teachers include nationally renowned Orchestra principals and Chamber musicians such as Peter Lloyd, Jeffrey Turner, and James VanDemark. Summer months have been spent at such festivals as the National Repertory Orchestra, New York String Orchestra Seminar, National Orchestral Institute, International Festival Institute at Roundtop, Domaine Forget International Festival, and Roycroft Chamber Festival. In addition to his various performance opportunities, Benjamin also possesses a certificate in Bow making, repairs, and rehairs from the Violin Craftsmanship Institute in Durham NH, and is proud to have personally studied with Dr. Don Greene, a renowned Performance Psychology coach who works with musicians, Olympic athletes, and S.W.A.T teams. Benjamin plays on a modern Double Bass, made in 2009 by Guy Cole of Arlington TX, a French Bow from Reid Hudson of Vancouver Island, British Columbia, and Bow rehairs by Mike Shank of Elizabethtown, PA.